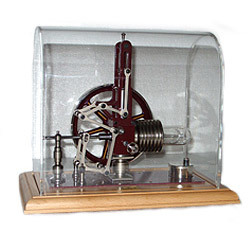 This stirling model developed by WIGGERS model engineering again is a self-produced model which shows a lot of movement in a fascinating process. This can hardly not be exceeded. Optically dominating is the big fly wheel of this model really in the middle of the model, whereby the other elements of the model exceed it nearly equally. By displacement of the heating- and operating cylinder constructively below 90 degrees the usual change of the working process is already determined so that the whole mechanism is executed by only one crank pin. The connection with rods, levers and angles provides for a fascinating process of movement. The adjustment of the number of revolutions from full speed up to standstill is also available. 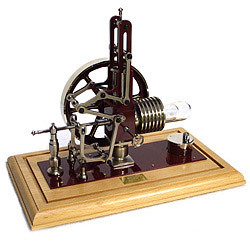 The slower the model runs with its many-sided mechanism, the more appealing is the process of movement .The model has a remarkable power due to the big dimensioned fly wheel. This power can be passed on over a cord pulley. Like all other models this model retained its own model engineering character. Some machine parts are again painted in WIGGERS-red; all other parts are durable nickel-plated so that even after years the surface looks appealing. By means of modern technology the model is free of maintenance and is heated by methylated spirit. The nuts in the beech wooden base board of the model center a representative acrylic hood, which gives the model a special feature wherever it stands. In the range of WIGGERS stirling model engineering this new model is medium-sized and needs the following place: length: 280 mm, width: 170 mm, height with hood: 230 mm. This model will inspire each admirer of technique and collector. It is handmade model for high demands and a quality gift for some great occasions, such as anniversaries, years of membership or a round birthday.